The Boston Agile Marketing Meetup Group meet at Hubspot and Mike Volpe gave a great presentation on Agile Marketing at HubSpot. At the Toolbox Inc., we’ve followed Hubspot for years and even took (and passed) their first Inbound Marketing Certification program years ago. Agile Marketing at Hubspot started many years ago, they are one of the really early adopters. Mike asked how many people had the experience or feeling that know one knows what they do, or everyone in the company thinks they can do marketing better than the marketing department. As the marketing department and Hubspot grew Mike increasingly found himself having these feelings. As a result, Mike meet with the chief software development officer (who had just gone to strictly agile development) to see if there was a way do use this process for marketing. In the beginning, it wasn’t easy, but there were a ton of benefits. For example, it created a ton more transparency and visibility. It increased their throughput and productivity. Flexibility improved. It improved the clarity around what was important for better focus, and maybe most important it changed the relationship of the marketing department to the rest of the company. 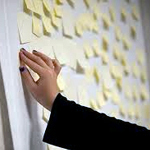 There were several tools developed for agile marketing. The first was the wiki that they used for sprints and scrums to track how they were doing. I was interesting to see Mike pull up past wiki’s to show what the tasks were and their results. He was able to pull a wiki from 2009 – one of there first sprints to show how things were developed. Because the wiki is open, you could see comments from the CEO right on the wiki! The second interesting tool they developed was the marketing science fair. This was done once a month and presented to the entire company. This really improved the transparency and communication within the company.